Iarnród Éireann will now commence the assessment process, which will be completed over the coming months. The project has also submitted a Railway Order application on 30th June. The project intends to have the PPPCo contract awarded by mid 2012 and construction completed and passenger services commenced through the tunnel by end of 2018. 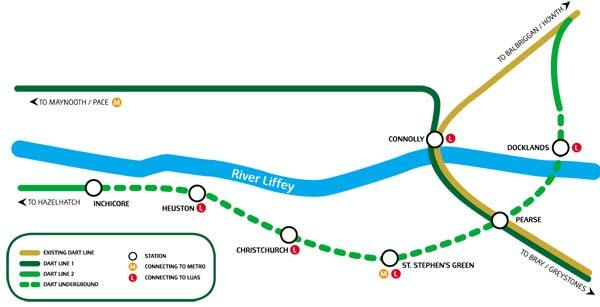 DART Underground will connect the Northern and Kildare rail lines, with underground stations at Spencer Dock, Pearse, St. Stephen’s Green, Christchurch and Heuston as well as a new surface station at Inchicore. It is the latest boost for commuters who will benefit from DART Underground, with the project having been confirmed in the Government’s Capital Investment Programme last week. DART Underground will also provide an important stimulus for the economy, on the employment side alone creating up to 7,000 jobs during each year of construction and thousands more indirectly as a result of the significantly improved access that the project will deliver to retail, commercial, leisure and tourist destinations in Dublin.